Seth Daniel Robinette, age 25, Erwin, passed away on Sunday, April 7, 2019 at the Johnson City Medical Center. He lived most of his life in Limestone before moving to Erwin. 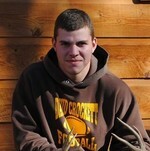 Seth graduated from David Crockett High School in 2011 where he loved playing football all four years. He was a very talented Machinist and won several awards during his study of the program while in high school. Seth placed twenty-fifth in the National Machinist Skills USA competition. Also, he was a very talented Carpenter and enjoyed helping in his father's remodeling business. Seth attended New Salem Baptist Church and Lower Higgins Creek Church of God. He was an avid outdoors-man. Seth liked to hunt and fish. He enjoyed riding his 4-Wheeler in the mountains and mudding in his Jeep. He was preceded in death by his grandparents: Reverend H.P. Lloyd, Don Robinette and Sally Patton Robinette; first cousin, Nikki Lloyd. Seth leaves behind to cherish his memory, father, Mitchell Robinette and Fiance, Lora Tipton, Erwin; mother, Ruthie Lloyd Zundel, Erwin; one sister, Jessica Danielle Robinette, Johnson City; grandmother, Hazel McIntosh Lloyd, Erwin; several aunts, uncles and cousins also survive. The family will receive friends from 12:00 Noon until the hour of service on Saturday, April 13, 2019 in the Robert Ledford Funeral Home Chapel. Reverend Kyle Tipton will officiate the 2:00 P.M. funeral service. Ritchie Armstrong will share remarks. Pallbearers will be Johnathan Norton, Zach Stelter, Ryan Coffie, Kelly Lynch, Josh Lloyd and Jared Burgner. Interment will follow in the Evergreen Cemetery. In lieu of flowers, the family would greatly appreciate donations be made to help defray the unexpected funeral expenses to: Robert Ledford Funeral Home, 720 Ohio Avenue, Erwin, TN 37650. Robert Ledford Funeral Home, 720 Ohio Avenue, Erwin, is privileged to serve the Robinette family. (423) 743-1380.